Happy Chinese New Year everyone! The astrological year of the Piggy and those little piggies represent generosity and wealth. Here’s to a prosperous and happy year for all! That’s about all I know about this holiday (sorry May!) but we all know Chinese food is amazing! Here’s a recipe to celebrate with this week, I’m not sure how authentically Chinese it is, but let’s just (wrap and) roll with it. 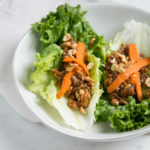 While there is no pork (lucky piggy) in this Lettuce Wrap recipe, you could certainly substitute lean ground pork tenderloin for the turkey. This recipe also differs from the sweet restaurant versions because of the Asian flavorings that add umami (umami basically means flavor explosion in your mouth, yes, my definition!) and also freshness from the mint. 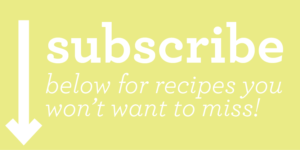 Why should you make this recipe tonight? everyone loves these healthy, clean tasting little bundles! Can I make this vegetarian or go Meatless Monday? I think you easily could, but chopping up some hearty mushrooms (or tofu, if that’s your thing) in place of the ground meat. Better yet, coarsely, ‘rice up’ some cauliflower, that would be tasty! Just be sure to brown your vegetarian choice well, to get that yummy savoriness out of it. Remember brown equals flavor! Kick up the heat a bit (if you want). Add some chopped chilis or red pepper flakes to jazz this dish up! 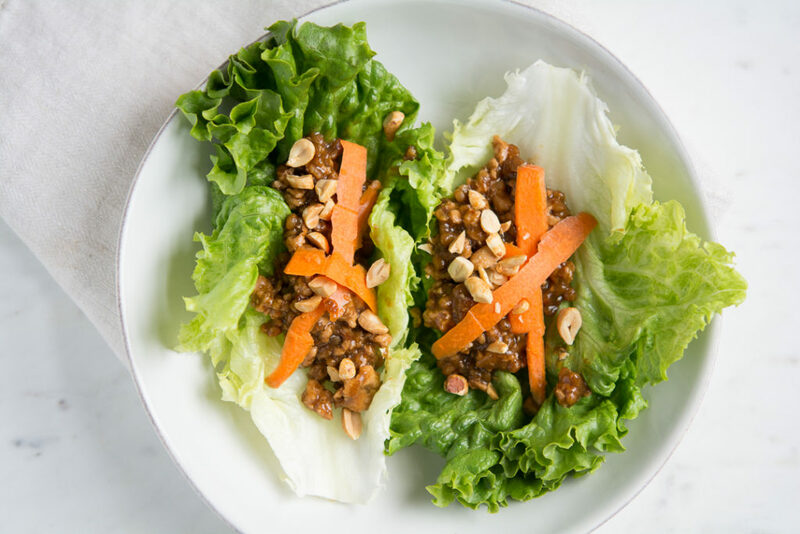 These wraps are so much tastier than the versions at restaurants, and by making your own sauce (yes, I will give you permission to use purchased peanut sauce!) you are controlling the ingredients. Be sure to read the ingredient labels for any allergens you or your family may have. Heat oil in heavy large skillet over medium-high heat. Add onion and ginger and sauté until beginning to brown, about 3 minutes. Add turkey or chicken and sauté until browned and cooked through, breaking up with the back of a spoon, about 7 minutes. Add peanut sauce, hoisin sauce, and 1 tablespoon soy sauce; heat through. (Can be made a day ahead. Cover and refrigerate. Reheat in microwave or skillet, adding a few tablespoons of water by if necessary, before continuing.) Stir in cucumber and chopped mint. Season with salt and pepper. Transfer turkey mixture to medium bowl. Place mint sprigs and lettuce leaves on a platter. 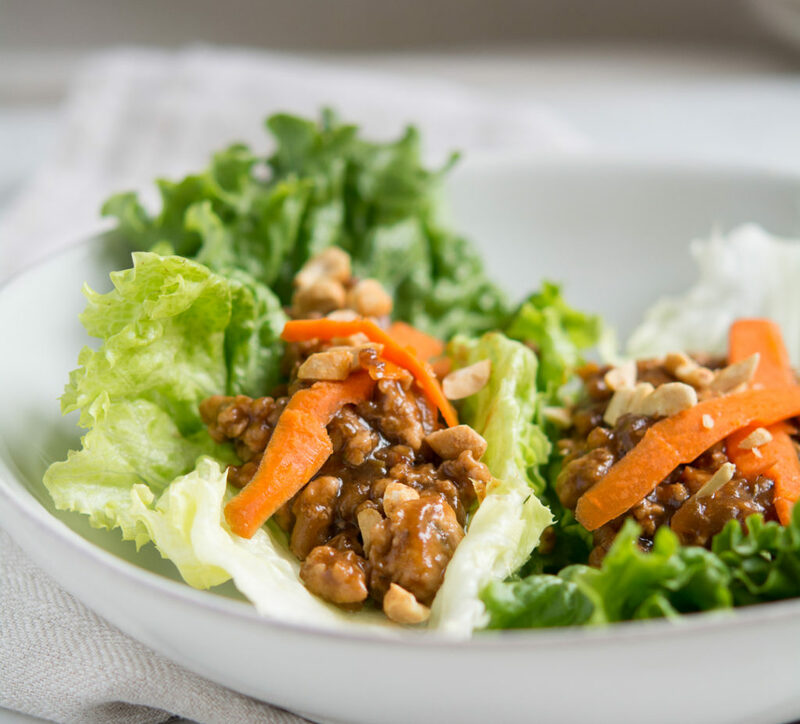 To make wraps, spoon turkey mixture onto lettuce leaves, add a few mint sprigs, shredded carrots, and peanuts. fold in sides over filling, and roll up. Pass additional soy sauce alongside wraps for dipping. This sauce can be made a day in advance and refrigerated. This sauce stores well (in a jar) in the fridge for a few weeks. add more water to make the sauce the consistency of a creamy sauce.